Often when I really enjoy a book, I have a hard time reviewing it. I typically start out my reviews introducing the plot of the novel. But sometimes, things happen even early on that I want you as a reader to discover just as I did–while immersed in the text. On the other hand, how can I entice you to read an excellent story without telling you something about it? There’s no way. 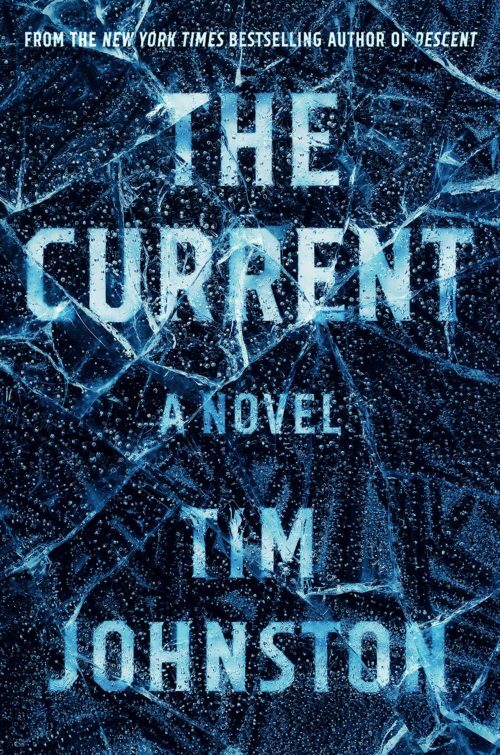 I can tell you that The Current is about, among other things, the relationships between young adults and their parents, particularly young women and their fathers, and the transforming beauty of love. It looks at the longterm effects of grief and loneliness, and how sorrow and evil leave their mark on a tight-knit community. It is extremely well written, such that I have marked it both as “literary fiction” and “suspense,” which in my world is a perfect pairing! Johnston writes with deft hand, creating a world that is entirely our own while at the same time having elements of beauty and magic. I feel that isn’t enough so I will give a little synopsis, but don’t blame me if you’d rather have found out the entire plot on your own. One fatal winter’s weekend, 2 young women, both 19, leave their college to drive one of them to her home in Iowa to visit her dying father. Their car ends up plunging into an ice-bound river, but it’s no accident. One survives, and as she heals, she is forced to contemplate the river, its treacherous ice, and the mystery of other girls who have gone into that same river before. The current takes life but also gives it; those who survive it have learned its secrets and can do so again. 10 years ago, another 19 year old girl went into the same river but did not come out. No one was ever arrested or charged with the crime. The surviving girl connects the two stories and begins to dig into the past, recognizing that justice for another is in one sense justice for herself as well, and others. But doing so may put her at risk once again, as buried secrets begin to surface. You guys, I can’t do it justice. Suffice it to say that this is an excellent book–complex, layered and intense, beautiful in its telling and unflinching in its portrayal. Go read it. It’s so good.